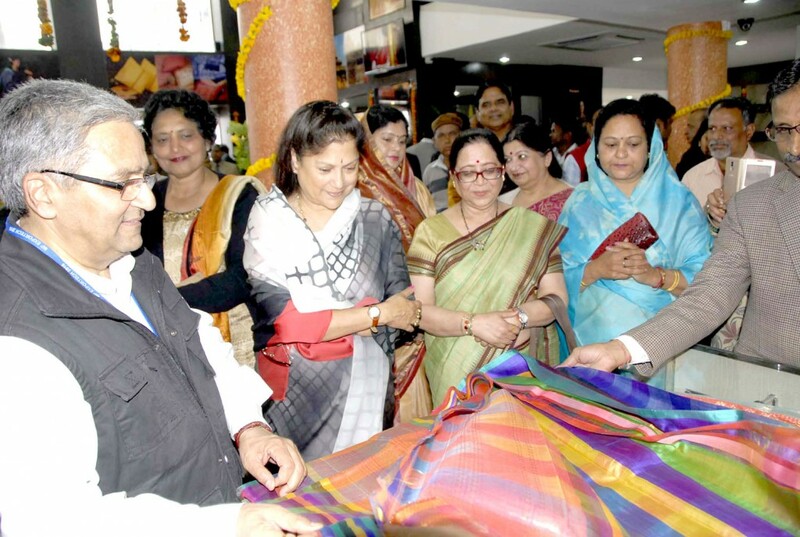 Bhopal, January 30, 2016 (Ataullah Faizan): Commerce and Industries Minister Mrs. Yashodhara Raje Scindia dedicated renovated Mrignayani showroom at Gwalior today. A sum of Rs. 55 lakh has been spent on renovation of the showroom at Patankar trisection. Mrs. Scindia said that in this age of competition, government establishments should also be tastefully and attractively decorated. Then alone customers will visit there. Mrs. Scindia inspected all counters of the showroom. She also apprised herself of products’ quality and demand by customers. Chairman of Gwalior Development Authority Mr. Abhay Choudhary, former Mayor Mrs. Sameeksha Gupta, Principal Secretary Industries Mr. Mohammad Suleman, LUN’s MD Mr. V.L. Kanta Rao, TRIFAC’s MD Mr. D.P. Ahuja etc. were present on the occasion.